Our Easy Dunker dunking tanks have been delighting crowds for years. The concept of dunking the boss at the company picnic, or dunking the local "celebrity" at fundraiser events has become an American pastime. We will deliver and setup prior to your event. We will pick up after event is over. We need a level area and access to water. The dunkee will need to keep their hands on their knees and sit forward on the seat. Never leave a filled dunk tank unattended by an adult. Keep dunk tank away from electricity. Keep water level filled to at least 8 inches from top of tank. Keep all non- swimmers and anyone under 5 feet tall out of tank. Always wear tennis shoes, to keep from slipping in the tank. 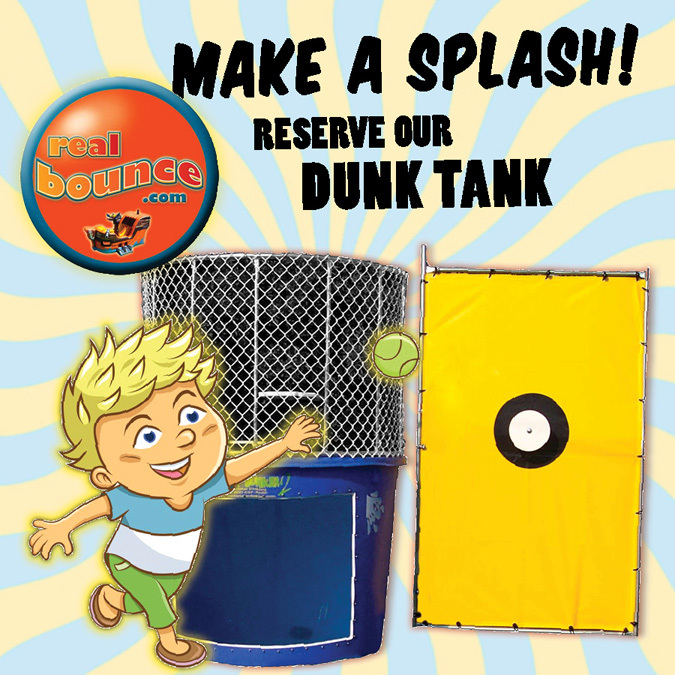 The dunkee needs to move toward the front of the tank when coming out of the water to avoid hitting their head on the dunk tank seat. Only one person at a time is allowed on the dunk tank seat or in the tank. Never use baseballs or other hard balls. Do not hit target with hands. Do not operate dunk tank during a storm.